According to UNESCO, the Climats in Burgundy are precisely delimited parcels of vines on the slopes of the Côte de Nuits and Beaune, south of the city of Dijon. They differ from one another due to specific natural conditions (geology, exposure…) as well as vine types and have been shaped by human cultivation. Since July 4th, 2015, the Climats of Burgundy are inscribed on the UNESCO World Heritage List. 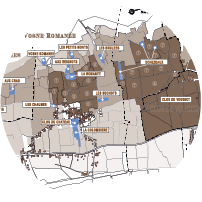 The Domaine produces 15 cuvees spread over the villages of Vosne-Romanée, Flagey-Echezeaux, Nuits-Saint-Georges and Vougeot. Please, click on the name of each of these parcels to have a description. 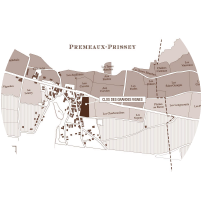 Premier Cru, this climat (2 ha 99 a 93 ca in total) is located on Nuits-Saint-Georges on the Vosne-Romanée side. Like its neighbour Les Boudots, it is a stony vine. Its name does not indicate the flight of crows, but “cras”, “crais”, a very common toponym in the Côte to indicate abundant stony hillsides, pebbles and abundant limestone pebbles, often from scree at the foot of the “combes”: consequences of the frosts and thaws of the last Ice Age 20,000 years ago. Who would have thought that you just had to wait to produce a great wine! Les Cras gives a wine with a sustained roundness, which can evoke aromas of discreet musk, cocoa and leather depending on its age. Soil and subsoil: The soil is rich in angular stones (up to 25 centimetres in size) forming a thin crust of pink-beige limestone that has a dull sheen, being Prémeaux limestone. This structure is very resistant to erosion and forms a strong topographic cover in the catchment area, emphasized by many dry-stone walls. The soil in places can be very thin on these limestone beds. 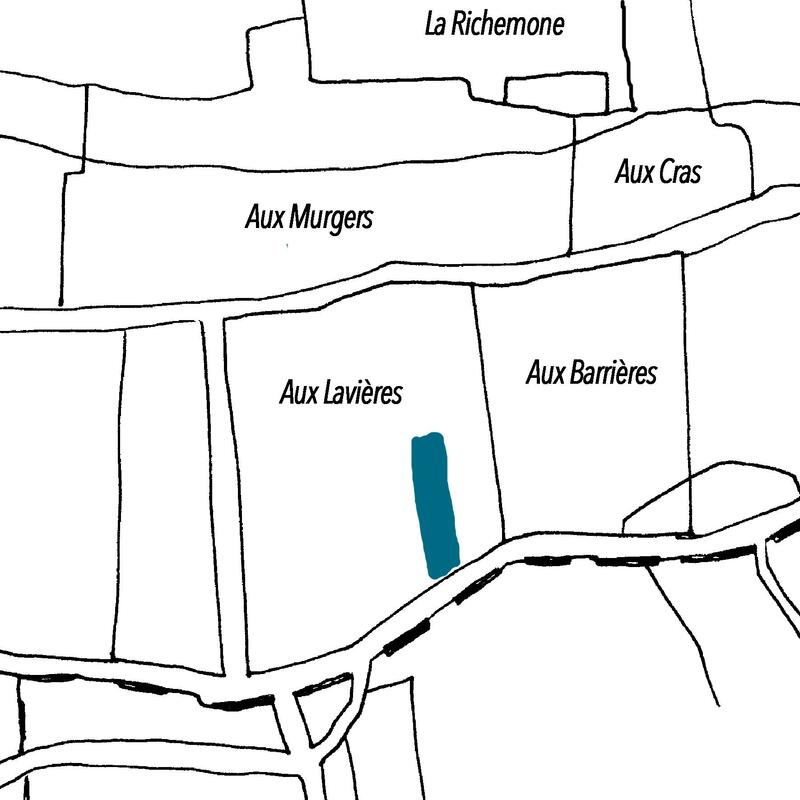 Small parcel of 11 a 75 ca located in the northwestern part of Les Chaumes, Premier Cru located between La Tâche, Les Malconsorts and Le Clos des Réas. Here, we touch La Tâche. This name seems to indicate formerly wastelands. A terroir close to that of Clos du Château, planted here in 1949 on the original soil. Indeed, the vine is below the road, hence the need for a wall and a contour – or the use of additional soil. The wall and the contour were wisely preferred here. The identity of this climat is fully respected (Les Chaumes extends over a total area of 6 ha 45 a 55 ca). Les Chaumes are part of the Domaine that the family kept after the 1930s. Marked by a quite present chew, this wine is reminiscent of the sweet spices of an oriental bazaar. Soil and subsoil: the parcel sits on the marls of Ostrea acuminate, which have been observed at the bottom of its neighbour Grand Cru, La Tâche. 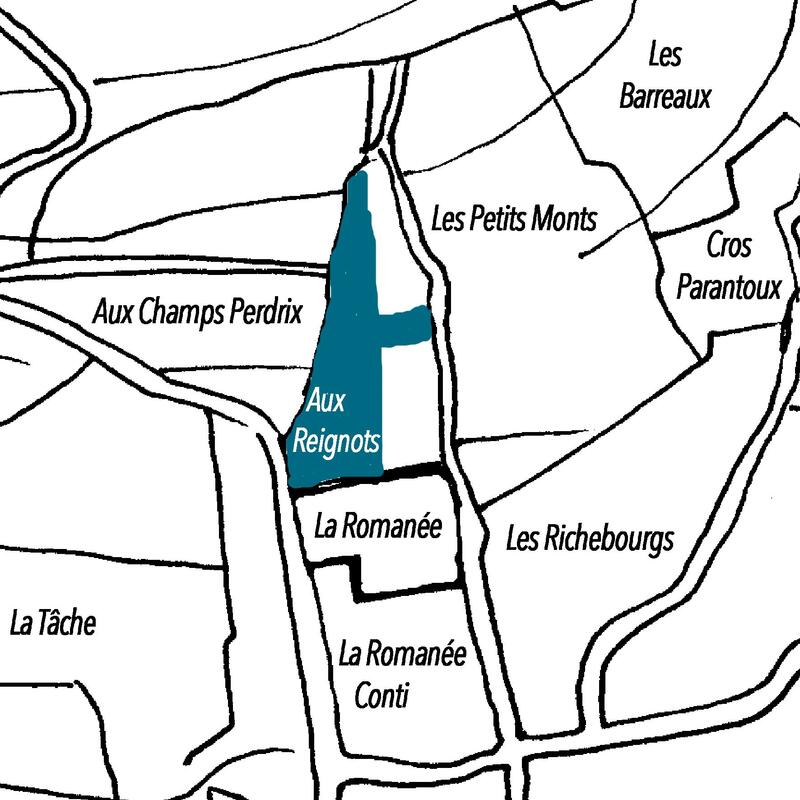 Aux Lavières is a Nuits climat adjacent to aux Réas in Vosne-Romanée bordering with a Premier Cru of Nuits-Saint-Georges (Aux Murgers). 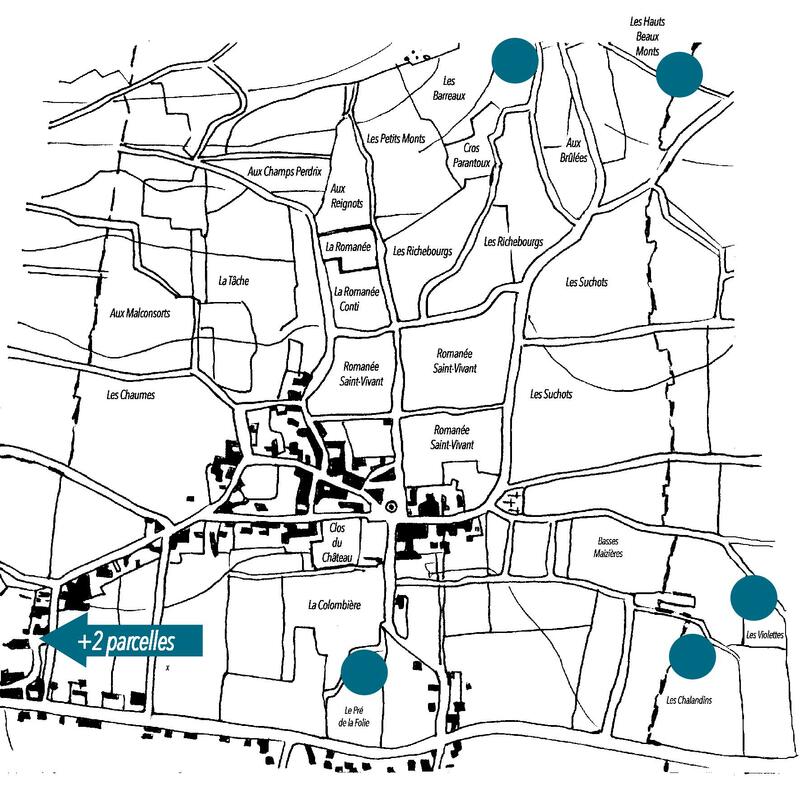 It covers a total area of 5 ha 97 a 17 ca. Les Lavières were in the Côte des Carrières, where lava or lauzes, these large, flat and thick stones used for roofing houses, “cabottes”, walls, etc, were extracted. The lavas were also collected in the Hautes-Côtes on the “pearly slab” on the surface of the soil. The vines that have replaced these quarries are therefore highly calcareous. Soil and subsoil: brown in colour, the soil being 40 to 60 centimetres thick, having a mix of salt and clay is only slightly stony (approximately 10%) with worn pebbles of consistent size, being 3 to 5 centimetres, and scattered flat ochre rock plates rich of oolith limestone and debris of marine organisms, originating with the creation of Ladoix or Dijon-Corton limestone. This cuvée is the blending of grapes of a dozen lieux-dits of Vosne, 40% from the North East of the appellation (Les Violettes, les Maizieres, les Chalandins), 40% from the South East of the appellation (Les Jacquines, Au dessus de la Rivière), and 20% from the West, on the hillside (Les Damaudes, les Barreaux, Les Hauts Beaux Monts). Age of vines: in 2017, 30% is 92 years old, 30% is 72 years old and 40% is 52 years old. Soil and subsoil: on the parcels in the Northeast and the Southeast of the appellation, the soil looks very much like La Colombière. For the Western part, the soil generally contains very abundant Comblanchien limestone gravel, in centimetre sizes, with a few scattered stones of angular shape being of rich white oolith limestone (pressed into millimetric sizes by the heaving geologic action and resembling fish eggs, creating their name). The cryoclastic scree, formed of ulative grezes, comes from the gelifraction of Comblanchien oolith white limestone lying on top. The spelling varies: Reignots, Raignots. These are small rounded flint cores, embedded in a different rock. Often covered with a reddish film, they are indeed reminiscent of animal kidneys, hence “reignots”, “raignots” in Burgundian patois. At the rising, the wall of La Romanée. A fault between the two climats. The parcel here climbs some 200 meters up the mountain. Extending over 73 a 19 ca, it is the largest of the Premier Cru (1 ha 61 a 80 ca), the only one to cover all the types of soil running from the bottom to the top of the appellation. Everything here is exciting because of the intimacy between this climat and its illustrious neighbours. Lots of active limestone. The soils here are very thin, rarely more than 20 to 25 cm of humus resting on the bank of the limestone rock. The roots of the vine sneak through faults up to 10 m deep to find the nutrients and water they need. In a dry year like 2003, plant life would have hard time withstanding without this deep resource. The wine here has a typicality that often evolves towards pyrotechnic notes, flinty, rubbed flint, firecracker and reduction, especially at the beginning of the ageing. These notes fade slightly in the cellar, revealing a high density of wine, richness and power unusual to this appellation rank. The Reignots are part of the Domaine that the family kept after the 1930s. Above the Reignots, the cross of La Romanée was erected on 4th June 1978 on the occasion of the golden jubilee of Canon Just Liger-Belair. Made of Morvan granite, it is the work of Roger Chopart, master-carrier in La Roche-en-Brenil and a gift of the Liger-Belair family. Soil and subsoil: the soil is characterized by a very high percentage of round gravel of Comblanchien limestone. It is very rich in active limestone, of good drainage and very sensitive to erosion. This angular gravel was deposited under forms of thick scree (up to 10 meters) resulting from the gelifraction of Comblanchien limestone during the Plio-quaternary era, formed on beds of white oolith, and ulative grezes. The Jurassic substrate is composed of white oolith, but this latter rock is certainly not an important element of the subsoils providing nutrients to the plants..
Squeezed between Le Cros Parantoux and Les Reignots, above the Richebourgs, Les Petits Monts occupy a very privileged position on the hill (3 ha 66 a 81 ca in total). Its sensual vinosity is pleasing in the mouth before climbing the steps of the palate one by one. Velvet and distinction share the emotion. Soil and subsoil: the parcel has a steep slope, characterized by the presence of abundant centimetre size gravel of Comblanchien limestone. This angular gravel in places forms thick deposits (at times more than 10 meters) connect in the catchment area to cryoclastic scree called ulative grezes. The pale soil is very rich in active limestone, of good drainage and very sensitive to erosion. The Jurassic substrate is composed of Comblanchien limestone, but this latter rock is certainly not an important element of the subsoils providing nutrients to the plants. 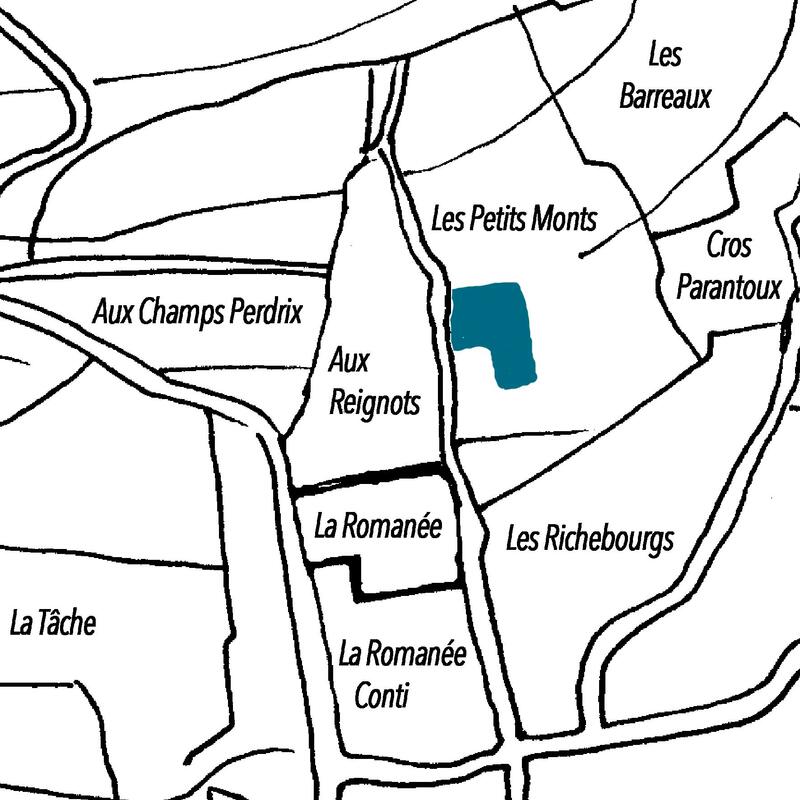 This “lieu-dit name” is found in Fixin, Nuits-Saint-Georges and Vosne-Romanée. 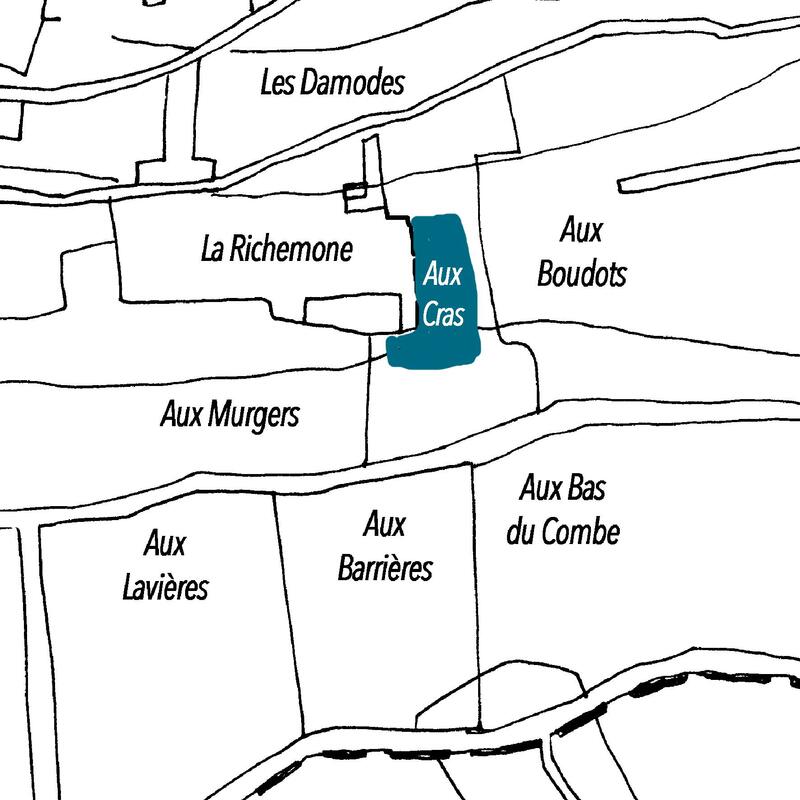 Here the Premier Cru is divided between Aux Brûlées (3 ha 76 a 54 ca in total) and La Combe Brûlée (76 a 75 ca). The word refers to fire, either literally (wildfire, perhaps of a building – or the old word “brûlis”, land whose brush was burned to improve the soil, the stubble-burning of cereal crops), or figuratively (sensation of intense heat under the effect of the sun). It is not excessive to evoke for this wine a passionate temperament that it must absolutely dominate to achieve lasting happiness. This tiny one-barrel cuvée of the Domaine, is only available in magnums, jeroboams and rehoboams, and is not sold. The magnums remain at the Domaine, while jeroboams and rehoboams are offered at charity sales. Soil and subsoil: the reddish-brown coloured chalky-loamy soil contains calcareous stones ranging from 2 to 10 centimetres, in both angular shapes (effected by the substrate) and rounded shapes (alluvial deposits at the outlet of the hollow). The outcroppings at the edges of road, below the tract, reveal a complex subsoil, with very pronounced Comblanchien limestone in the East, white oolith in the middle part, and Prémeaux limestone in the Western part. All of these facets bounded by a complex network of fractures are recrystallized by way of the faults found there. Soil and subsoil: The reddish-brown surface rests on a bed of Prémeaux limestone on the west side of the parcel. The beige-pink limestones are compact, forming a thin crust, with spots of “Chailles” (nodules of silica, almost like flint) flush with the cross erected in the southwest corner of this Grand Cru, where Les Reignots begins. The eastern part of this particular parcel probably rests on deeper clayey limestone that are formed in plates. 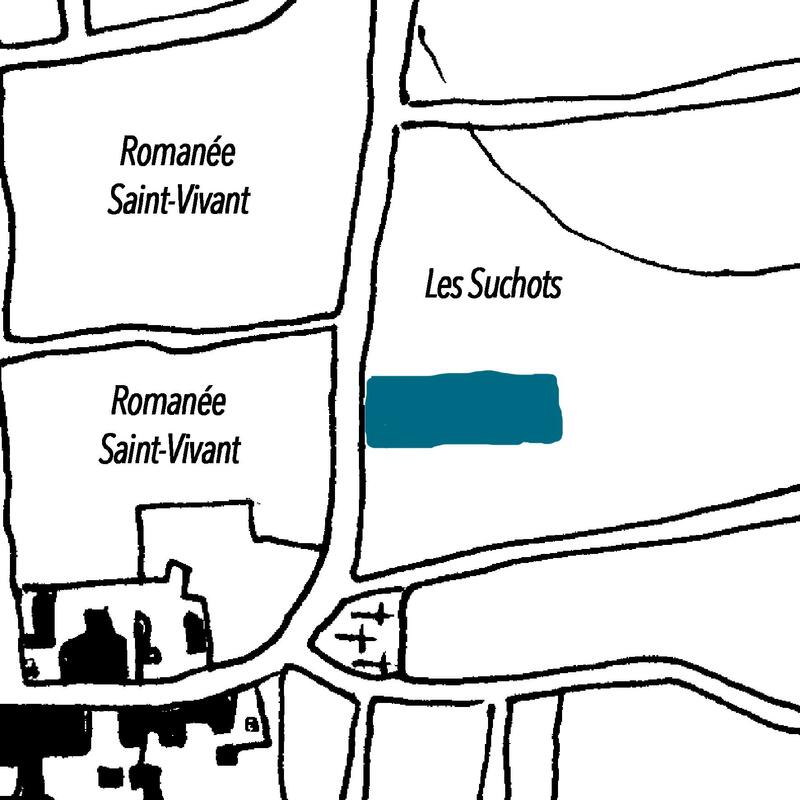 Les Suchots (13 ha 13 a 60 ca) form the largest Premier Cru of Vosne-Romanée. It would be the oldest toponym of the appellation: a mound, a rugged slope, or according to another version a derivative of the word “souche”, after deforestation. On the edge of Flagey-Echezeaux and Echezeaux, it is often gleaming and is not embarrassed by the neighbouring Grand Cru. Soil and subsoil: the reddish-brown soil contains some consistent stones, often rounded, in general less than 5 centimetres, in limited quantity, being approximately 10% of the area. These calcareous stones of varied nature are sometimes coated with a salmon-coloured limestone and clay mortar, characteristic of deposits that were put in place during the creation of the terrain in the Oligocene period, known as salmon conglomerates. 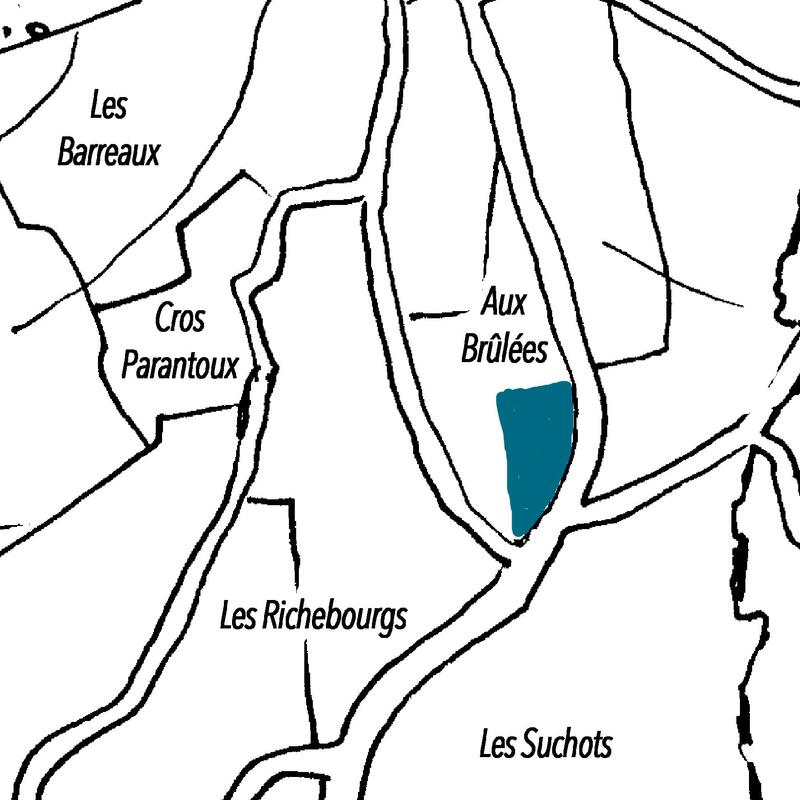 Parcel of 78 a 26 ca located on the piedmont, a soil born from alluvial of the Saône, mainly clayey with some limestone traces for about thirty meters west of the parcel. This high proportion of clay can cause problems in wet years due to excess water on the plant. Taken over in 2000, the ploughing of the soil allows here to gradually reduce this difficulty. This type of soil is common in Vosne, with 80% of the village appellation located on the piedmont. La Colombière (3 ha 80 a 34 ca) is perfectly representative of a Vosne Village, especially since the vines here are mostly over 70 years old. 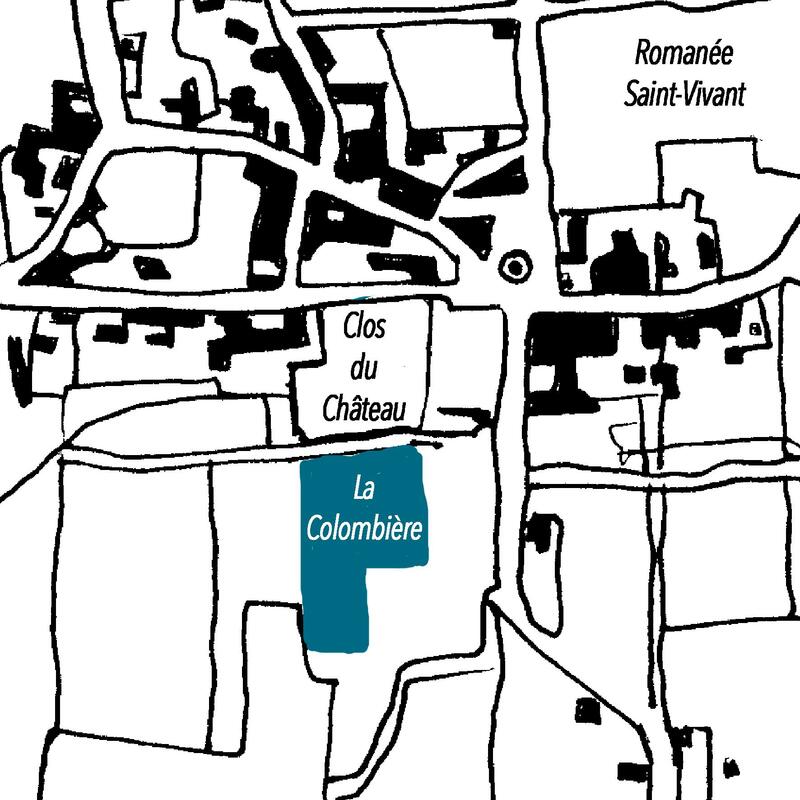 La Colombière belongs for a very long time to the vineyards of the Counts Liger-Belair in Vosne. This name seems to come from a “colombier” (or dovecote), classic equipment of a seigneurial residence. 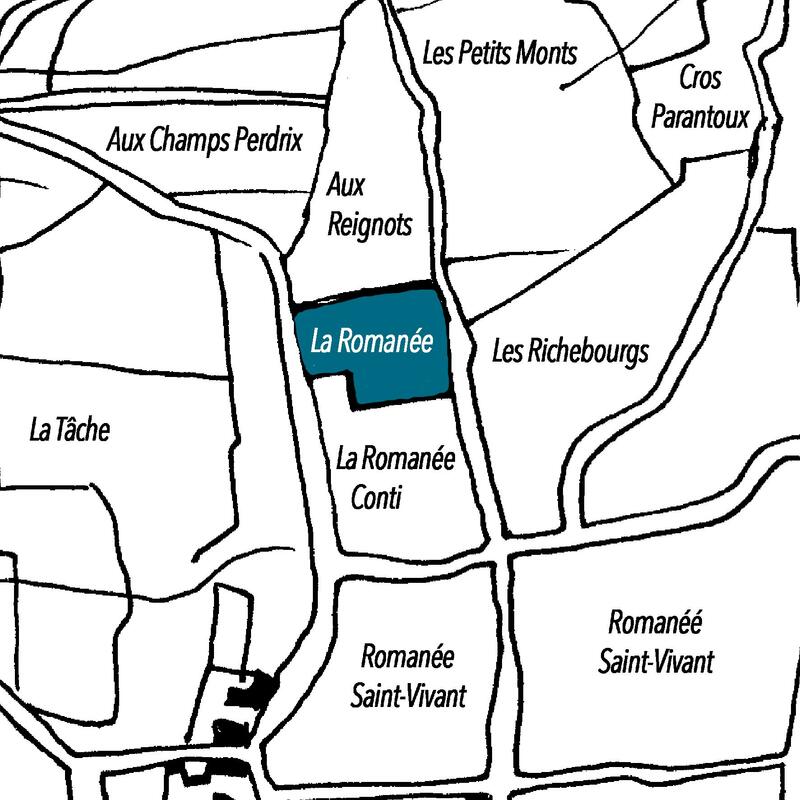 Located exactly on the east-west axis (where La Romanée-Conti and La Romanée are located), a little lower on the relief, this climat differs by a slight difference in altitude as well as by the nature of its soil. Its texture is quite “yummy” and round with very expressive red fruits aromas. 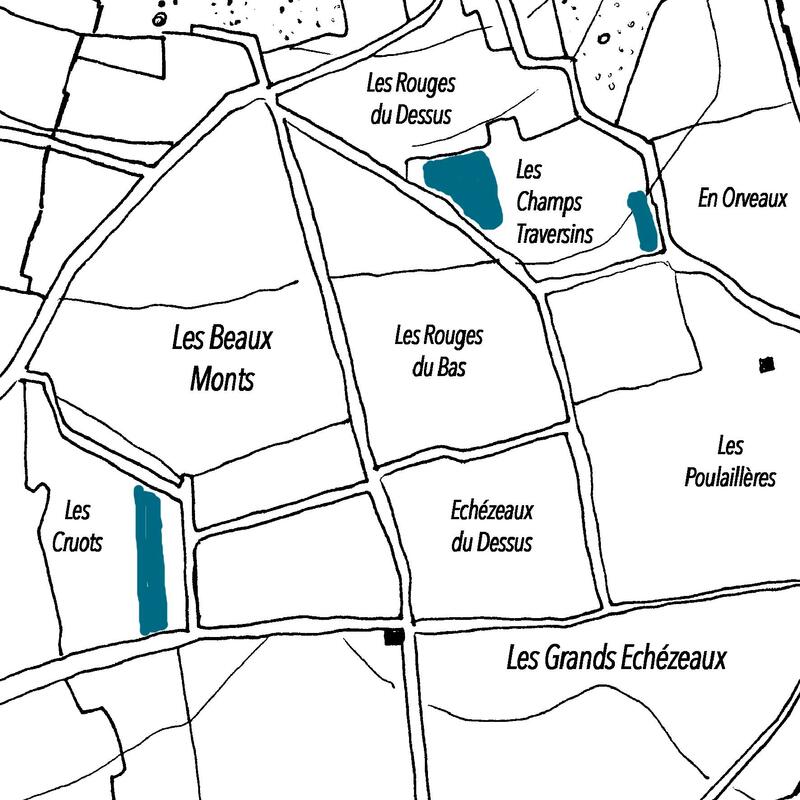 Echezeaux have been recognized as Grand Cru since July 1937. They are located on Flagey-Echezeaux over some 36 hectares and have a dozen climats. 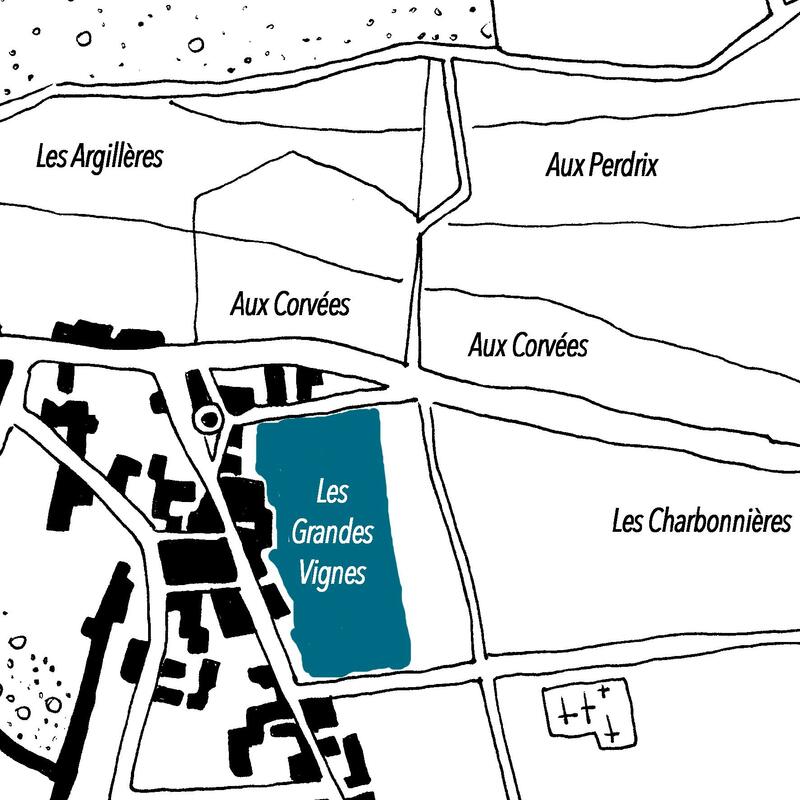 Our vines are located in Cruots or Vignes Blanches (on the edge of Vosne-Romanée) as well as in Champs Traversins (at the top of the hillside). Cruots indicates a stony ground and Vigne Blanche an old plantation of white grapes; Champs Traversins, vines planted across the others. Historically these two climats are among the best estimated within the appellation. They complement each other admirably: a thick soil, rich in Champs Traversins, stony and limestone in Cruots. Charming in its youth, this wine often “fades” for a few years then comes back in strength, with brilliance, after five to ten years. A thousand graces on a very firm structure: iron fist, velvet glove. Soil and basement: for Les Cruots or Vignes Blanches the red-brown topsoil provides a rocky surface of approximately 10 to 20 percent, depending on the sectors. The eastern part of the parcel rests on the fragments of columnal crinoids, sometimes known as Indian beads. A fault puts them in contact with Comblanchien limestone in the central part, and a second fault is flush with Prémeaux limestone at the eastern end. For the Champs Traversins, the steep slope associated with the abundance of angular gravel, of average centimetre size, composed of Comblanchien limestone, with fairly pale soil, allows for identification of the ulative grezes, cryoclastic skree which formed during the periods of periglacial activity in the Plio-Quaternary era. What is a monopole? A climat, a “cru” belonging to a single Domaine, or managed by a single one. Thus Clos du Château. The monopole is a guarantee of added value because it ensures several qualities including the loyalty of a family to a cru, the guarantee of a single signature for this wine. Parcel of 83 a 04 ca, at the western limit of La Colombière (to which it belongs), with characteristics close to it and however different. A vine of about 45 years old. Here we are in the presence of an authentic Clos, surrounded by four walls. It was between 1850 and 1970 the park of the château which had once replaced vines and a few houses. If the slope is null at La Colombière, it is about 1 % here. What does it matter? Think again. The proportion of limestone is much higher here, with fallen rocks of the hillsides that are found at a depth of 70 cm. At 1.20 m we feel an emotion: this pink marl that we meet at 80 cm in La Romanée Saint-Vivant. A very compact marl, not very permeable. As this parcel was drained in the 19th century, when the park was established, the percolation water was collected by the drains and did not stagnate. 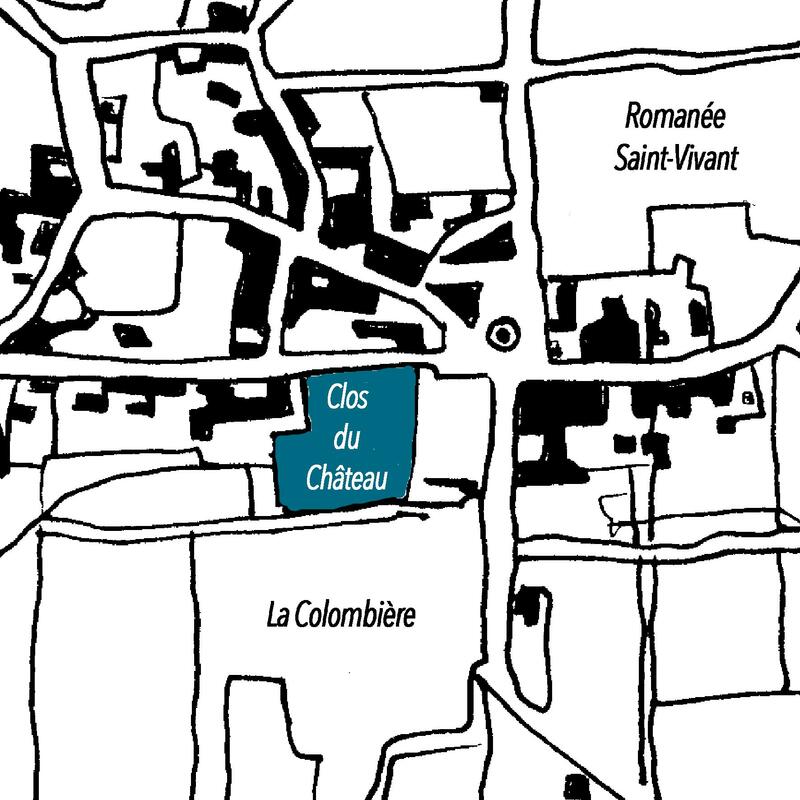 Clos du Château produces a wine marked by a minerality and a tension, a race that distinguishes it from that of the neighbouring La Colombière. created during the Oligocene epoch, which was when the Côte’s terrain was developed. Comment: 2015 is the first vintage. This cuvée is made with purchased grapes from a long-term contract with a certified organic producer. 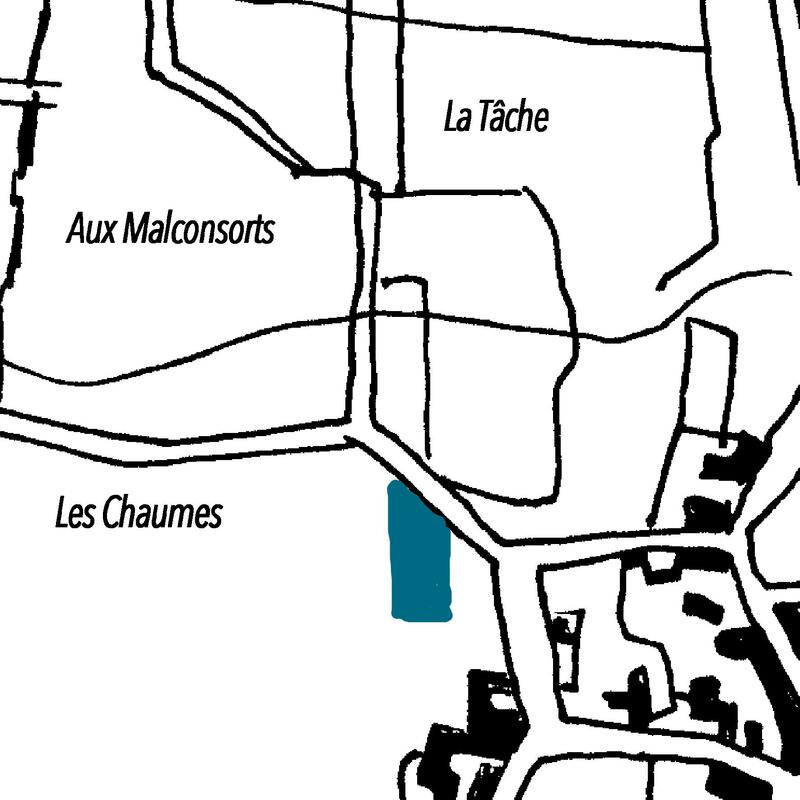 Located mid-slope, on the Vosne side of Clos de Vougeot, this parcel belonged to the Liger-Belair family until 1933. This Premier Cru Monopole extends over Prémeaux (2 ha 19 a 53 ca) and we know its owners for some 200 years. Thus in 1855, the Viénot, Jean de Curley and Edouard Jacquinot. In 1892 the Viénot, Monin, Cogneux, Gilles and Britschgi families. It owes his high reputation to the Viénot lineage and in particular to Charles Viénot, an emblematic figure of the Burgundy vineyard in the 1930s. Michel Viénot, last representative of this family, sold this clos to the Thomas family (Moillard) in 1982. In 2006, Domaine du Château de Puligny-Montrachet acquired it and resold it to Domaine du Comte Liger-Belair in 2012. Close to Corvées Pagets, only Premier Cru to flourish east of the appellation, this climat gives a wine full of vigour and suppleness. He plays his card in white and succeeds well. Soil and subsoil: The soil, which is between 40 and 60 centimetres thick despite its position on the slope of the parcel, is comprised of clay-loam, and is brown in colour. The surface is approximately 20% rocky, with pebbles ranging from angular to dull-edged, ranging in size between 2 and 15 centimetres. A patina of fragments of shale (nodules of silica, similar to flint) attests to ancient formations. The Jurassic substrate is rich ochre oolith limestone also with debris of marine organisms, certainly either Ladoix limestone or Dijon-Corton limestone.